You’ve seen the bigger version and now Tiny Shinu has been made available! First seen at last weekends ATT 3, Thailands Jemusu James of Jemusu Studio shows small isn’t always a bad thing, right ladies? Anyway, just like his bigger brother Shinu The Jiangshi Dog. 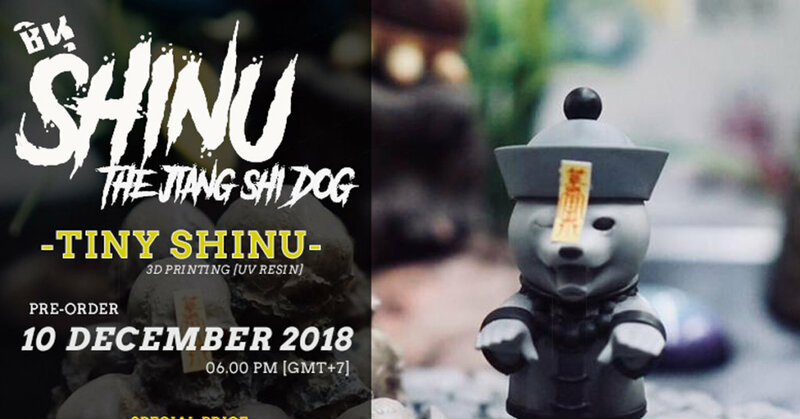 Jemusu Studio take on the lovable Shiba Inu in the form of a Chinese Hopping/Jumping Vamper has now gone mono and smaller, he needs a new home and promise he’s toilet trained and is vegan. WHEN: Pre-Order will start on December 10th, 2018. Facebook 10 pcs. / IG 10 pcs. total = 20 pcs. Facebook: https://www.facebook.com/JemusuStudio Instagram: jemusu.studio and Wechat: JemusuStudio.